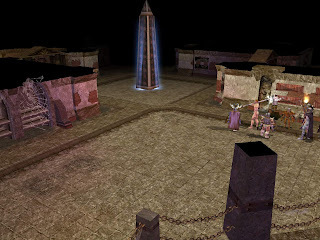 "There were a number of open crypts around the large chamber in which they found themselves, but everyone was drawn towards the huge obelisk towards the centre of the tower. It stood firm and tall and had fiery glyphs drawn on every one of its sides. When approached they revealed their message for all, "Here lie the Elf Lord founders. Their memories will never be forgotten all the while the towers of Torén Norus and Torné Norus stand."